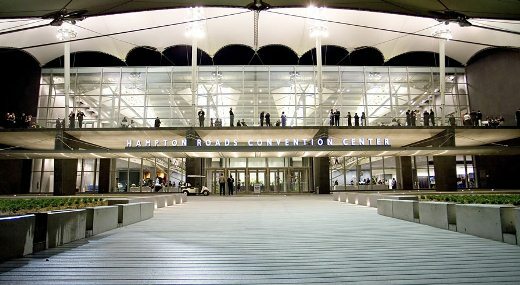 The 4th Annual Hampton Chess & Sports Festival took place on 15-17th February at the Hampton Roads Convention Center, 1610 Coliseum Dr., Hampton, Virginia. Among the 20 Sports Under One Roof there were also chess competitions, Chess Championship in two sections – Open & U1600, and Scholastic Championship. VA Sports Festival Chess Championship was a 5-round Swiss tournament rated with USCF. There were two playing sections: Open and U1600. The Open section had 14 participants. Yuri A Barnakov 2289 and Andrew Rea 2154 shared the first place with 4,0/5 points each. Gary Robinson 1865 is third with 3,5/5 points. The U1600 section featured 26 players. Chris Giofreda won the competition with the perfect 5/5 score. Michael A Williams 1580 and Nathan Wu shared the second place with 4,0/5 points each.